Microsoft's Surface range of tablets were never successful enough to make a big impression in the tablet market, and this is mostly attributed to the fact that the Surface tablets tried to replace both your tablet and your laptop, and thus ended up failing at replacing either properly. Now Microsoft is upping its game with the recently announced Surface Pro 3, by choosing to make it much closer to a work-oriented PC. But by doing so, Microsoft sacrificed the portability factor which benefited the previous Surface tablets' use as a tablet for entertainment. Whether Microsoft's decision to make the Surface Pro 3 more laptop than tablet was a good one or a bad one isn't yet clear, but with a higher resolution screen, better cameras, and a considerably slimmer body, the Surface Pro 3 is definitely a better device overall than its predecessor. Since it boasts a much larger screen than previous Surface tablets (12" compared to 10.6"), the Surface Pro 3's dimensions are inevitably larger, even though the size difference was slightly compensated with slimmer bezels on the Pro 3. Measuring 292.1 x 201.4 x 9.1mm, it's far from an ultra portable tablet. In fact, it's about the same size as Samsung's Galaxy Note Pro 12.2 tablet (295.6 x 203.9 x 8mm), which evidently has a slightly larger 12.2" screen. The Note Pro 12.2 is significantly thinner, but then again, the Note Pro 12.2 doesn't have an Intel Core CPU, and nor does it run full Windows 8.1. In fact, the Surface Pro 3 is a very thin tablet considering the hardware it packs. It also weighs 800g, which, again, is pretty light for a 12-inch tablet with an Intel Core processor. In comparison, the Galaxy Note Pro 12.2 weighs 750g. The back of the Surface Pro 3 is made from the same VaporMg magnesium alloy construction seen in all other Surface tablets, but like with the Surface 2 it has a light-silver colored finish. This makes the tablet very sturdy, and it also looks very premium. The kickstand which has always been unique to the Surface line is back, but it's much improved. The first-gen surface's kickstand had a single 22-degree angle, which didn't make it ideal for many usage cases. The second generation had two angles, 22-degree and 45-degree. Now with the Surface Pro 3, the kickstand can open to any degree between the initial 22-degree stage and the 150-degree limit, making it far more versatile than its predecessors. The Surface Pro 3 also features improved cameras: two 5MP units on the front and back of the device. the high-res front-facing camera makes the Pro 3 a very good device for video conferencing. As for the rear-facing camera: given that a 10-inch tablet is already very awkward for taking pictures, imagine how doing that with a 12-inch tablet would look like! In any case, it's there, and it's decent enough for a tablet. The Surface Pro 3 marks the first upgrade in the display department since the original Surface Pro. It's bigger, has a higher resolution and a much more interesting aspect ratio. The 12-inch size offers much more screen real estate than the previous Surface Pros' 10.6" displays, with the only trade-off that the tablet becomes a bit too large to be considered a portable tablet. The resolution has been upgraded from 1920 x 1080 to 2160 x 1440, and the screen aspect ratio is now 3:2, which makes the screen less wide and taller (in other words, squarer) than the usual 16:9 Windows tablets, including the Surface Pro and Pro 2. As with the other Surface tablets, the Pro 3 uses Microsoft's ClearType technology, which fuses the display layers into a single layer, the benefit of that being less screen reflectivity and therefore better sunlight contrast ratio. Microsoft has made the right choices with the Pro 3's display. The larger size makes its use as a productivity machine as well as a fully-fledged laptop replacement much more feasible, and the increased resolution is also a great improvement. Like I said before, increasing the screen size makes it more suitable for a laptop replacement than a proper media consumption tablet, but this compromise is probably the right one to make. For the tablet form factor even the Core i3 is already a very good processor and should be fine for most basic tasks. I'd say that the Core i7 model is a bit overkill for a tablet unless you want to use it for gaming or for more intense tasks. All Surface Pro 3 variants have an internal fan for cooling, but they're generally quiet and therefore shouldn't be an inconvenience. However, logically the higher CPU bins, especially the Core i7 model, are more likely to make the fan run faster and noisier, as well as use up battery faster, as all Surface Pro 3 models have the same 42Wh battery. Taking heat dissipation, fan noise, battery life and performance in consideration, I consider the Core-i5 model the ideal compromise between these variables, since it's fast and at the same time not too power hungry. By the way, Microsoft claims 9 hours of continuous web browsing for the Surface Pro 3, which is very good for a tablet with this hardware, although I'm not sure how the different CPU bins will vary in terms of battery life. As with other Surface Pros, the Pro 3 comes with a digital pen stylus. This time however, it's not a Wacom digitizer, which means there are less pressure sensitivity levels (256 in the Pro 3 vs 1024 in the previous Surface Pros), but the new NTrig technology allows for some nifty software features. As usual, there's no place on the tablet's body to store the Surface Pen inside. The Surface Pro 3's new 3:2 screen aspect ratio combines very well with the stylus, as in portrait mode, the screen's proportions make it look rather like a 12" drawing pad. Microsoft is offering the Surface Pro 3 in a variety of different processor/RAM/storage options. The entry-level model has a Core-i3 CPU, 4 GB of RAM and a 64 GB SSD drive and costs $799. Then there's a Core-i5 model with 4 GB of RAM and 128 GB SSD storage, which goes for $999 and another Core-i5 model, but with 8 GB of RAM and a 256 GB SSD, costing $1,299. Then there's a Core-i7 model with 8 GB of RAM and a 256 GB SSD which costs $1,549 and finally there's the most expensive Core-i7 model with 8 GB of RAM and 512 GB of SSD storage, which costs $1,949. 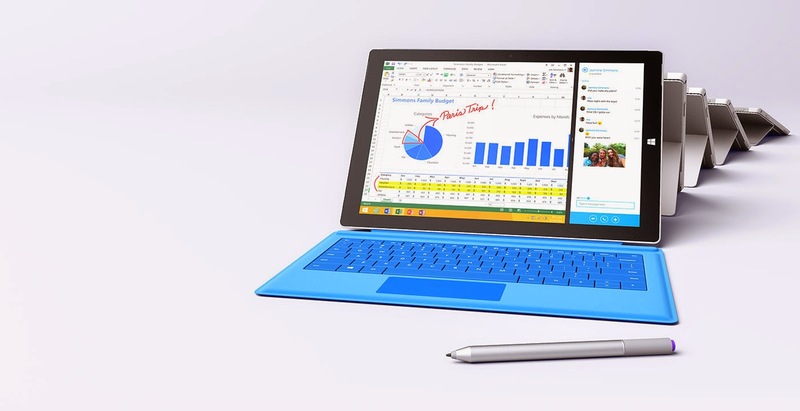 The Touch Cover for the Surface Pro 3 is sold separately, and costs $129. Microsoft should really have this keyboard bundled with the tablet, as the tablet itself is already very expensive, and like I said before, the Pro 3 is more of a work-oriented laptop replacement than a media consumption tablet, and in order for it to do what it does best, that is, replace your laptop, it needs the keyboard cover. The first two Surface Pros tried to be both a laptop and a tablet, but failed at being any of the two. Now with the Surface Pro 3, it's a device that excels in productivity tasks, therefore making itself a worthy laptop replacement, and is at least usable as a tablet, but sacrifices the portability factor that is why people usually buy tablets in the first place. So while it is a compromise, it's the best one Microsoft could've made. So what is the verdict on the Surface Pro 3? Well, it has the screen real estate, the hardware, software, and a keyboard cover to fully replace your laptop, and at the same time it's also more portable than any ultrabook out there, probably has more battery life than most of them, and can still double as a tablet, albeit a very large one. Wrap that up with a versatile kickstand, a high-res screen, a chassis that may just the the thinnest to sport an Intel Core CPU and an improved stylus and you have just about one of the best tablet-laptop hybrid devices so far, and most certainly the best Surface tablet ever released. Microsoft Surface Pro 3 is not only a tablet but it also gives you the features and quality of PC. You can also called it a PC, it's gives you the next level generation and then you can taste the high speed and lots of other functions. Now let's look its specification that are "Intel Core i7" "RAM 8GB ROM 512GB" "Microsoft Windows 8.1 Pro Update 64bit" "CAMERA Rear 5MP, Front 5MP" "Application Office Home and Business Premium". At the day of Christmas we are offering the best rates on our all products specially for Microsoft Surface Pro 3, So just place your order on TRD Electronics and enjoy this multi tablet.